My Plate: June 8, 2012 Kraut – For Breakfast? When the garden starts to produce lots of fresh vegetables, you’ll often find vegetable hash on our plates for breakfast or dinner. Once you learn how to make hash, you can swap in any vegetables, spices, and protein to keep things from getting monotonous. It’s also great because it’s one skillet meal, making it great for traveling as well. If you wanted to you could even eat it right out of the pan! 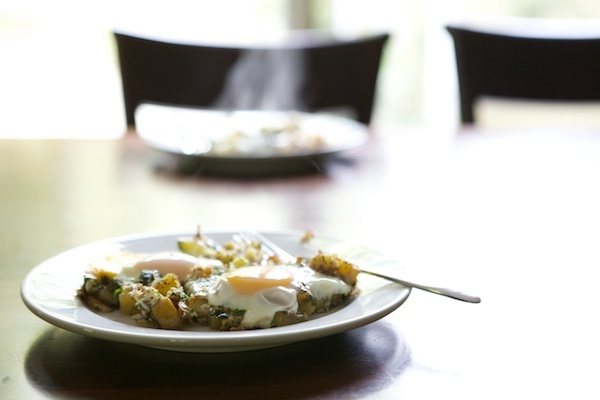 Lately we’ve been especially loving potato, onion, garlic, and zucchini hash for breakfast with eggs poached on top. Every now and then I’ll also add cheese, bacon or sausage if I have them in the fridge. 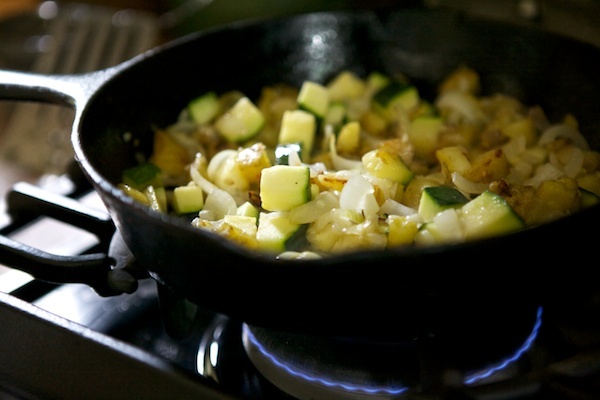 The beauty of hash is that it’s a one pot meal, it’s quick, you can use whatever vegetables & protein you have on hand. It’s also great because you don’t need loads of each ingredient, making it perfect if you have a small edible garden. The key to making a good hash is to figure out which order the vegetables need to go into the pan for proper cooking times. I usually start with potatoes, then a few minutes later onions, peppers, zucchini. 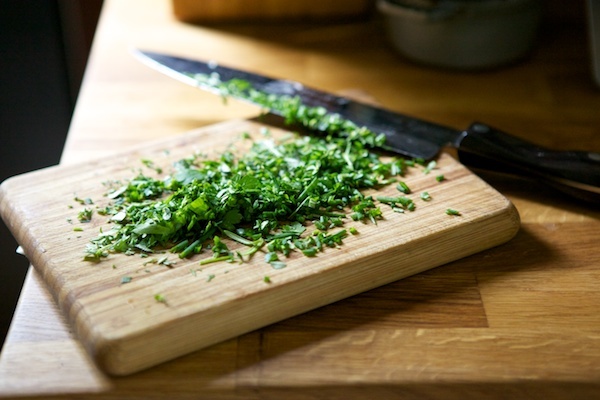 The garlic is added a minute or two before serving and the freshly chopped herbs are sprinkled on at the last minute. I also add some kind of seaweed to mine, dulse, nori flakes, or sometimes spirulina or chlorella for added health benefits (all sourced from Mountain Rose Herbs). If you plan on using sausage, meat, or bacon, cook over medium heat in a cast iron skillet. Remove from pan when cooked. Add the vegetables in order of cooking time: potatoes, carrots, beets or other longer cooking root vegetables first, a few minutes later zucchini, peppers, onions, etc. Cook, stirring frequently, until the vegetables start to brown and soften (usually total cooking time for me is about 10-15 minutes). When vegetables are almost done, add diced garlic and stir. If you plan on adding sausage, bacon or other meat, return cooked meat to the pan at this time. Also add cheese at this time and cover with a lid. After a minute or two, depending on how cooked you like your garlic, turn off heat, sprinkle with diced fresh herbs and freshly ground salt & pepper. Our preferred way of enjoying hash with with eggs poached on top. To do this: add them when you add the garlic, cheese & meat. I like to mix in the sausage & garlic, then crack eggs on top of the hash and cover with grated cheese. Place lid on pan and cook over low heat until eggs are desired consistency (for me that means barely cooked with a runny yolk). Season with freshly chopped hers and salt/pepper. Enjoy! Hot Italian sausage with onions, zucchini, eggplant, sun dried tomatoes, garlic, oregano, olives and roasted red peppers topped with romano cheese. Potato, zucchini, onion, garlic, rosemary, and thyme with eggs poached on top. Beets, carrots, potatoes, onions, garlic, rosemary, and thyme with beef. Onions, zucchini, garlic, fresh tomatoes, oregano, garlic, olive oil, mozzarella cheese with eggs poached on top. Spinach, leeks, garlic, thyme, white wine, and cream with eggs poached on top. Brussels sprouts, bacon, onions, and parmesan or romano cheese. Do you ever eat hash? What’s your favorite flavor combo? Funny! I just stepped away from my own, cooking on the stove. Zucchini, potato, and corn. I add bacon and a little parmesan, along with some bread crumbs for texture. It’s one of our favorite things, and we grew everything but the cheese and wheat ourselves. 🙂 Yum! Corn sounds great – I’ll have to remember to add that when I find some at the farmer’s market! 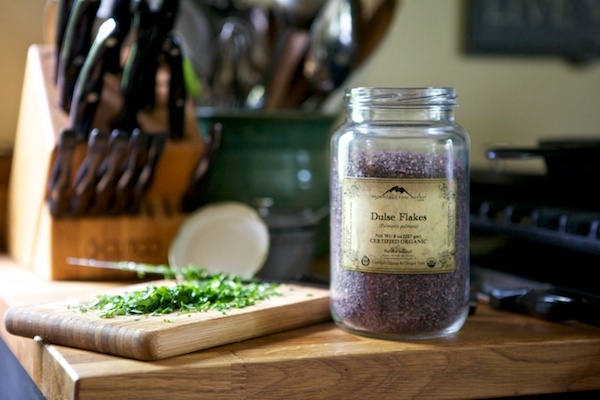 Looks yummy, don’t you just love Mountain Rose Herbs! I see I am not the only one who pulls their label off their packaging and puts it on the canning jar! I really like how their labels will re-stick nicely to a jar!